Conversations about technology are pervasive in Silicon Valley and the surrounding communities of the San Francisco Bay Area. These discussions cover significant topics from the impacts of an influx of tech workers to seemingly daily, new mobile applications. One area that would benefit greatly from more exploration around the role of technology is our parks and public lands. This is a topic that the Institute at the Golden Gate is keen on examining as technology becomes more embedded in our daily lives and technology-free spaces become more difficult to come by. It’s important to recognize the legitimate reasons that make people uncomfortable when broaching this topic. Parks have long been considered spaces to disconnect, and the introduction of more technology could bring up issues such as the potential to disrupt natural ecosystems and impair the human-nature relationship. Additionally, parks, like other natural resources, are subject to overuse, an issue that will need to be navigated carefully if increased technology makes good on its promise to bring in more users. Addressing these concerns will be necessary; however, they shouldn’t impede productive dialogue around technology’s potential to improve the park user’s experience. This includes the possibility of added technology enhancing community engagement with non-traditional parks users like seniors, girls, and minorities. It can also include making parks “smarter,” meaning they employ technology to improve health, resilience, energy efficiency, effective operations and maintenance, and more. When it comes to merging parks and tech, the Institute’s partners at UCLA’s Luskin Center for Innovation are making great headway. 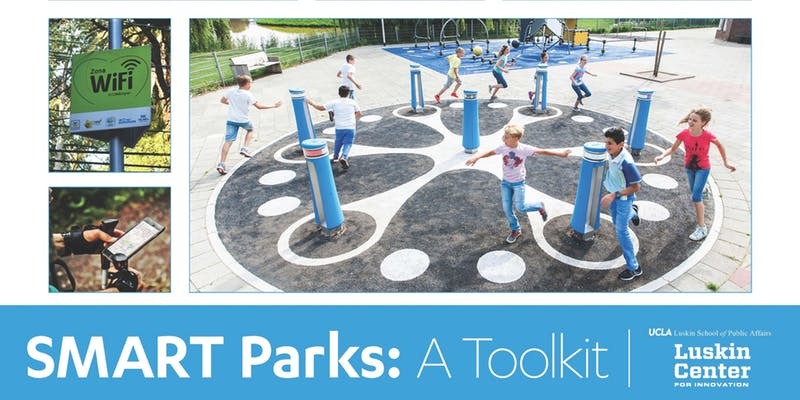 For years they’ve been pioneering research in this space and recently published SMART Parks: A Toolkit, a guide for making parks smarter through different park components, from urban furniture and amenities to hardscapes and activity spaces. The toolkit can be used by park managers, designers, advocates, or anyone who wants to learn how technology can be incorporated into parks. It describes each technology, how it fits into a park setting, its benefits, and potential challenges that park managers may face when implementing it. Many opportunities exist for park staff to adopt forward-thinking solutions around tech’s ability to improve park experiences, whether it be reducing long-term costs of inefficient infrastructure or captivating new park users through gamification. The Institute is excited to enter this space and see how new and existing park technologies can be leveraged to bring the well-documented benefits of spending time in nature to new users. With more work emerging from this field, it will be fascinating to see how technology can work to deepen human-nature connections and inspire new park stewards to protect the future of our parks and public lands.